Billy Budd: It's wrong to flog a man. It's against his being a man. 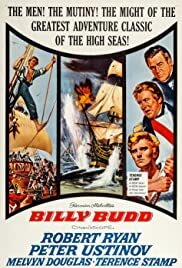 Q: What is 'Billy Budd' about? Q: How are we to understand this movie? Nothing can touch the book (quality-wise), but this Ustinov-directed epic of '62 is clearly under-rated for it's time with some fine performances with beautiful B/W cinematography. Ustinov also plays Captain Vere in a subdued and strange performance. Robert Ryan (superb actor is right on the money as Claggart. 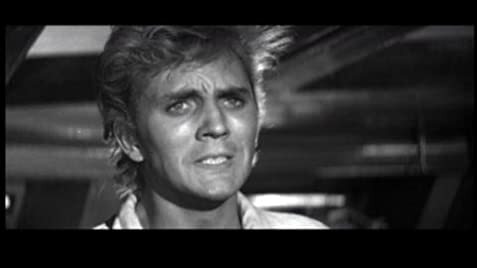 Terence Stamp (in his film debut, I believe) is the perfect Billy Budd and well deserving of his supporting Oscar nomination. An 8 out of 10. Best performance = Terence Stamp. Melvyn Douglas is crusty as usual and David McCallum is well-cast and officious. This was adapted from one of the classic American novels so the film could only be criticized rightfully, but a stunning achievement in retrospect!